I seem to have a mild allergy to wheat, so no wheat berries for me. I decided to substitute wheat berries with everyone's favorite seed that poses as a grain: quinoa. 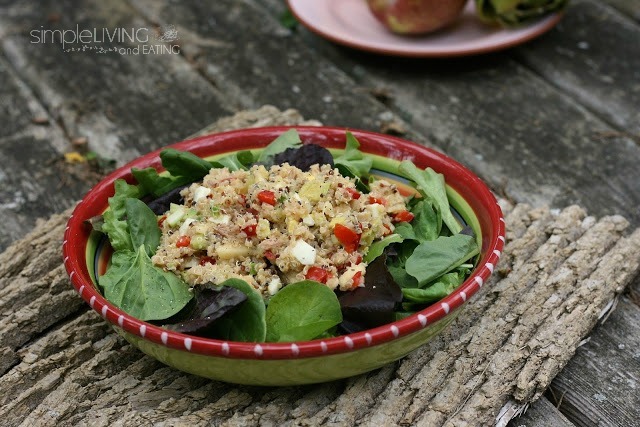 Yes, this salad is gluten free and quinoa contains all the amino acids, it's high in iron and magnesium,... so yes, it is super healthy. I made this salad the day before to be eaten as a packed lunch. The original recipe called for the salad to be laid over tomatoes, avocados, and eggs in a bed of lettuce. Instead I minced everything up except the lettuce and mixed it into the salad. I also used Tonno tuna and felt that one can, instead the two recommend by Dorie, gave it enough tuna flavor without over powering the rest of the ingredients. I really think mincing all the ingredients helps to blend the flavors in a salad, and I find myself and my family like salads made this way a lot more. Chilled over night and eaten cold for lunch this salad was a big hit, even my vegetable hating teen son loved it. 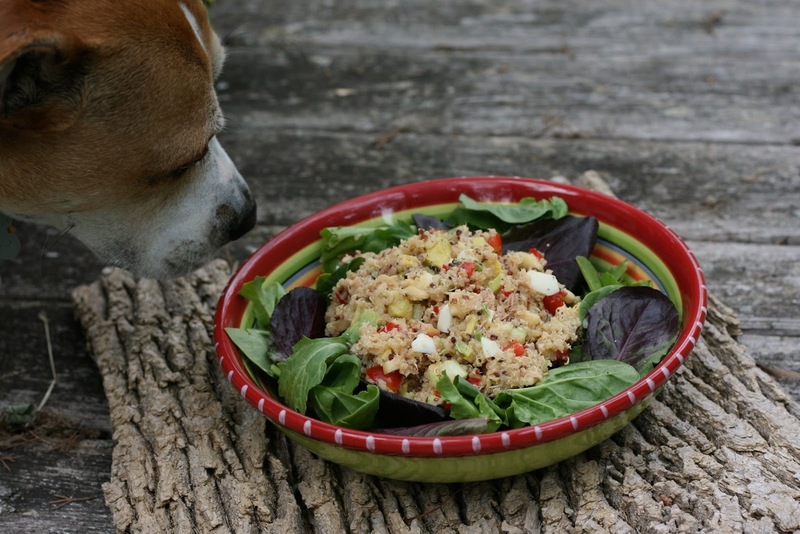 We even had a surprise lover of this salad: our dog! 1) While the quinoa and boil the eggs are cooking, whisk vinaigrette ingredients together and put it aside. 2) Mince salad ingredients and mix them together in a large bowl. 3) When quiona and eggs are cooked mix them with the vinaigrette and salad ingredients. Serve warm or refrigerate for at least 2 hours and serve chilled over a bed of lettuce. Note: Make sure you cook the quiona until it is light and fluffy on the dry side is best for this salad. Diane, So glad to know this was well received…I plan on making it today to serve for my Fourth of July barbecue. Looks yummy! Happy Fourth! Happy 4th to you Kathy... very delicious. Your guests will love it. I like your version - I have a funny feeling that we will be seeing many variations on this week's recipe. I didn't even know there are spelt berries. I can eat spelt. Good to know. This looks great for summer, nice and light! Super light and super healthy all in one meal. your salad looks very nice. I am making it today. think i'll follow you and mince and mix everything together. Thanks.. I hope you enjoy it. Sounds delicious. I love quinoa and it's a heck of a lot quicker to cook than wheat berries so I make it much more often. Maybe you can make wheat berries in a rice cooker? But it is wonderful how quickly quinoa cooks up. I love the photos with the dog. I enjoyed this one also. It's good to know this works well with other "grains" and also with everything just fixed on in. Yes, I was glad it worked out. What? Dogs like wheat berries? Why am I always the last to know these things? I love your pup!! I'm not sure it was the grain that attracted my dog, more likely it was the tuna and eggs... she loves her proteins. LOL - I love the fact that the dog enjoyed it. Quinoa is a good sub in. My dog like everyone else in the family has a fine palate... LOL. I just adore those last two pictures. Dorie would enjoy seeing those, especially the next to the last one. I couldn't find wheat berries and had both quinoa and Israeli couscous in my pantry. I went with the couscous so am glad you tried guinoa. What I especially enjoyed was the mustard vinaigrette. I squirted a little lemon on the top of my salad also. That seemed to bring out the flavor more. Will add capers next time. I think my version would mix together well also. Good idea. Thanks for your e-mail. I am sending you an e-mail when I finished with all my comments. I was worried Dorie might think her recipes are going to the dogs... So glad you tried a different starch than I did. Good to know that there are other alternatives. Yes, I agree Mary the vinaigrette was fantastic. I am already pondering what to to do with it next. Lemon sounds great, and both my daughter and I love capers. Glad to see you are around this week. I was in the woods this weekend. Will get over to your post probably tomorrow. This looks really good! 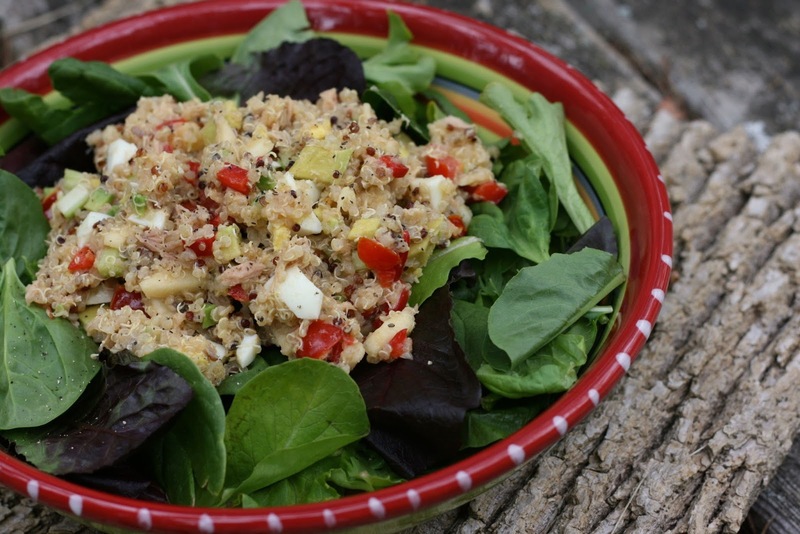 We love tuna and quinoa! Visiting from This Gal Cooks. It is a great combination. Thanks so much for stopping by. This is genius. I eat quinoa all the time, but never thought to add it to tuna. Great idea!! Thank you Elsa... you are going to love it. It works so well. I am always stumped when it comes to cooking things with Quinoa. I got a nice pack and its been sitting in the pantry waiting.. :) Thanks for this post. i am definitely trying this out! Definitely don't be intimidated by it. Quinoa cooks really quickly and can be substituted for any recipe that calls for rice. 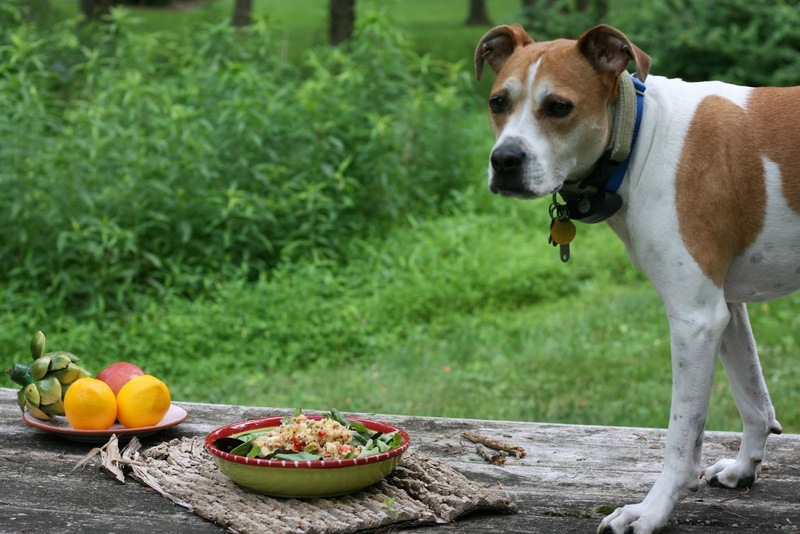 Your little dog is precious and that salad looks great! Hope you are having a great summer weekend and thank you so much for sharing with Full Plate Thursday. Thank you... she would love your sweet dog too. From the types of recipes you post I would guess you would love this salad. I hope you try it soon. Any grain is good with it.